1. A description of someone who has an earnest desire for some type of achievement or distinction; such as, power, honor, fame, or wealth, and the willingness to strive for its attainment. 2. In a manner showing the desire for personal advancement and may suggest equally a praiseworthy desire. 1. 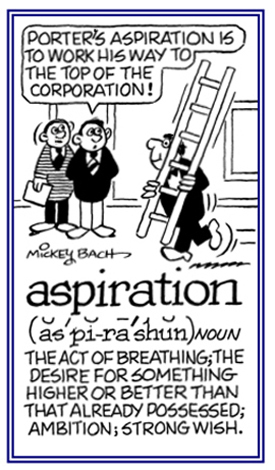 A strong desire, longing, or aim; an ambition: Mary's studies indicate her intellectual aspirations. 2. A goal or objective desired: The sixteen-year old girl has had aspirations to be a professional golfer ever since she was four-years old. © ALL rights are reserved. 1. Exerting oneself vigorously; trying hard: Henry's science teacher was striving to make himself understood by his students. 2. Making strenuous efforts toward any goal; such as, striving for success. 3. Contending in opposition, conflicting; competing. If you always do what you’ve always done, you’ll always get what you’ve always had. No one rises to low expectations. The quality of American life must keep pace with the quantity of American goods. This country cannot afford to be materially rich and spiritually poor.